Cupcakes 'n Daisies: Wordless Wednesday . . . It took me two days to piece and trim my 320 half square triangle units for Autumn in my Garden. Next up, turning these squares into sunflower petals. 1. The Buggy Barn has announced that due to popular demand, and since the book with the pattern Autumn in my Garden is out of print, they are now selling just the pattern. It's available here. All the easier for you to make that quilt too! 2. Hilda, at Every Stitch, finished her Carolina Lily quilt the end of August, it's one of the most amazing quilts I've ever seen online. If you happened to miss the post where Hilda blogged about the completed quilt click here, you won't want to miss it. Even if you didn't miss it the first time, go look at it again, I've been back several times and am amazed every time. 3. 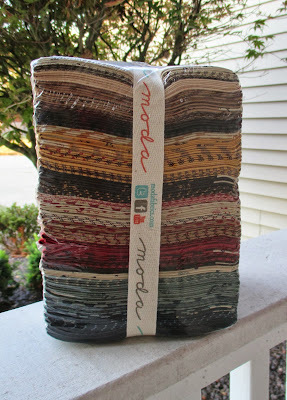 And finally, a few weeks ago I was the lucky winner of 65 ten inch squares of Tula Pink fabric from Moda Lissa. She's cleaned out her stash and has been giving away fabric almost every day for the last two weeks. Since winning the fabric made my day, I thought I would share that feeling with someone else. So I looked through my stash and decided I could part with this, Collection for a Cause, Historical Blenders by Howard Marcus for Moda. It's still in its protective wrap. I'm running this giveaway the same way Lissa is running hers, leave a comment today, the winner will be announced tomorrow. I always get a kick out of reading the comments when I ask a question that allows me to get to know you better, here's this giveaway's question, "What is/was your favorite thing about your mom?" If the USPS will deliver to your address you're eligible to win. Please leave a way for me to contact you should you win. That's if for Wordless Wednesday, thanks for stopping by! The favorite thing about my mom is, that she is very generous and thoughtful. Can't wait to see Autumn in the Garden done. I got my love of sewing and quilting from my mom. Score! And unconditional love. Sadly my Mom has passed. She loved to quilt and tried everything to get me started, but you know young people, they don't listen. I started way to late in this hobby that I love. Wish I had listened. Cakes my Mom cooked each sunday : here is my Mom's favorite thing. My mom was the church organist and choir director. She was a wonderful seamstress and made all my clothes, including my wedding dress. She never drove a car. I don't think of her as a quilter, but she did make several. She died 34 years ago at age 52, and I miss her every day..
My mom was so talented in so many ways...basketry, painting, tatting, and yes of course, quilting. Just about any handcraft, she did. She was my inspiration and my first teacher. Her love of family and commitment to marriage is a role model I strive to live up to. But, of all the many things I miss about my mom, I would say I miss her saying to me "you don't have to be so sassy." Gosh, I miss her so much. My mother is a sweet, loving, wonderful person. I talk to her every day and often wonder what I will do without her when she is gone. My favorite thing about my mother is that she has always listened, offered advice when asked, and has encouraged me to follow my heart. She is not a quilter but she is my greatest cheerleader whenever I finish a quilt. Thank you for offering this giveaway----I've worked with brights the past couple of years and I'm really wanting to use more muted, darker tones now. She always told us ever since I can remember you can do whatever you put your mind too. she wanted us to follow our dreams....it has always stuck with me whether career wise, hobby wise....life wise. Thanks! a great giveaway just like Lissa's! That we talk just about everyday and that we each share a love of reading. She is the best!! Thank you for a chance at your giveaway. My mom and I would always watch football together. She loved to yell at the TV and pretend it could hear her. Thanks for a great offering. I love her accent. She is from the Netherlands and whenever I hear someone with that accent it reminds me of her and home. Her sense of style - it was in everything she touched (hopefully including me!). Thanks for the chance to win this fabric - the Collections for a Cause have been some of my favorites. My favorite thing about my is that we quilt together. Always follow your dreams. Love the cause collections. Thanks for the chance to win it. My mom was one to encourage me to accomplish whatever I started and was always there for me. I truly miss my mom but she made me a better person and mother. Thanks for offering your great give away, hope to win. One of the things I loved most about my mom is how much she enjoyed her grandchildren. She spent hours playing board games, doing puzzles and reading them. I also admired how she remained calm under pressure. She passed away six years ago and I think of her every day, and almost always smile at the memory. My mom is 94. I remember her saying is that she regretted giving up her maiden name. I think that she was always very modern and kept up with the times. If her clothes were out of date, she made or bought new ones. Being modern throughout the years is one thing I liked about my mom. What a wonderful question and generous give-away, Thelma. My mom has lived with us for over 2 1/2 years after a sudden change in her health. Each day is a challenge for her but she deals with what comes without complaining and just does what she can. She is an inspiration and a joy to have with us. Guess that is the most thing I miss about her. That's a hard question for me, Thelma. However, I think my favorite thing about my mother was her positive attitude. Even at 91 before she passed away, she was in a nursing home and bedridden and when you asked her how she was doing, her immediate response was "well, I woke up this morning and she would laugh". She was my very best friend. My mom just passed away a few months ago and there are so many things that I miss about her. It's hard to pick a favourite, but one might be how this otherwise very conservative woman would dance around in celebration with you if you had happy news to share. She loved so unreservedly. The favorite thing about my Mom is her ability to bring so much fun and joy to everyone around her. If you asked her grandchildren they would say her homemade cookies and pies. I love my mom's grit and blackberry pie. Actually, I love all her pie. My dad was in the military and we moved every year. She made it seem like no big deal. She was our rock. My mom was not realllly my mom cause my biological mom left me shortly after birth. BUT my step-mom became my mom when she married my dad when I was 7. She was like a fierce lioness with me and made up for all those years I didn't have a mom. Even when she had her own children I never felt second best in her eyes. Thank God for step-moms! My Mom was a military wife. She was the one who kept everything together during our many moves and while my Father was away for long stretches of time on his ship. She taught me to be an independent woman long before the women's liberation movement came on the scene. Wow, I could write a novel about things I love about my mom. I think her spirit is the thing I love most. We call her "Little Miss Independent", she's 5 feet tall, 83 years old, still keeps two houses (Florida/Michigan), mows her own grass and when my dad passed away I made her promise me she wouldn't get up on the roof anymore. She won't ask for help unless she absolutely cannot do it herself. Plus, she has a wild, kind of snarky sense of humor. She's a hoot. Thanks for the chance to win - that's huge bundle, would make a wonderful quilt. Just the fact that my Mom (&Dad) raised 12 kids makes her amazing, but that she is fun, loving and supportive of all of us. We are all productive citizens and we all get along with each other and are happy to spend time together. Oh and that she still has her sanity! Amazing!! Thanks for the chance to win. 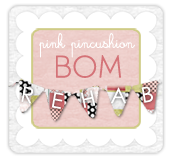 I just love your blog. Anne D.
One of the many things I appreciate about my mom is her patience. I remember her teaching me to sew and crochet when I was very young. She was never impatient with me. I am forever grateful for what she did. My Mom was so funny -- she always "got the jokes." She could do anything, from pulling a calf (don't ask) to hanging wallpaper. And of course, sew! The best thing about my mom was her ability to give all her children the freedom and sense of independence while we were growing up. It has served us well in adulthood. Thanks for such a generous give away and such an inspiring blog! Oh, I want that fabric!! My mother will be 89 next Tuesday and lives alone. My mother has always been very generous and a wonderful example of helping others. She continues to try to help others. My mom was a busy farm wife with nine children. Cooking, laundry, gardening and other chores took up most of her time, but she was able to nurture the artistic side if her nature. She was always good at picking colors for sewing and decorating. Later she became an accomplished artist in oil paints. The best thing about my mom is that she's very smart and taught me how to problem-solve. There isn't anything that my mom couldn't figure out when she put her mind to it. Thank you for offering the giveaway. I love reading your blog posts, especially when there are pictures of Cooper mixed in with the quilting projects! How generous you are! My favorite thing about my mom is that she where my love of sewing and reading came from! My mom is 90 and even though she has had a rough go in life, she always just trucks along. I can't keep up with her most days! My favorite thing about my mom is her unconditional love and support for her children. She was always serving us when we were in the home from a hot breakfast every day to a snack waiting for us when we got home from school to well prepared meals. She often sacrificed her own needs so that her children could have things. She worked alongside my dad in the small grocery store they owned for many many years. Today she continues to spoil her grandchildren and helps to provide clothing for them. My mom is one of my heroes. My mom taught me to be a strong woman and since I'm an Army wife, that has been a very valuable trait, to say the least. My mother was 23 with a newborn (me) and a 19 month old (my sister) when my father (a fighter pilot) was shot down over North Vietnam. He is Missing in Action. She raised us alone until my father was declared dead and then she remarried and moved on. So many MIA families were caught up in all the "angst," anger, and unknown, but luckily for us, we had a normal life. I grew up in South Dakota and always said I would never marry a farmer or a military man. What can I say? Love is powerful! As I reflect back, the thing I loved most about my Mom was how much she loved me, even when I was unloving. She walked through a lot of hardships in her life, losing a child, going through a divorce, but she had me late in her life, so I think she felt she was blessed to have me. And I was blessed to have her. I just did not realize it at the time. I lost my Mom when I was in my 20's. I remember her often and still miss her. My mom has an incredible sense of humor! Many years ago someone commented that she was funnier than Steve Martin, we still fondly remember those words! Wow! I would love to have this fabric. My Mom was a great cook and entertainer in her day. Not so much now unfortunately but I still have her in my life. Thank you for the chance to win. I loved how independent my Mom was, even thou she lost my dad at an early age and had a big family, she always just "carried on". She was the glue that kept the family connected for years. To this day I still love and miss her terribly. E.P. My favorite thing about my Mom is her love of life. She is fully involved in all 5 of her children's lives, 12 grand children's lives, and 7 great grand children's lives. The favorite thing about my mom was that she could talk to anyone and was always interested in what they had to say. Thanks for the link to the Carolina lily quilt. I have mine still on my to do list so I love seeing everyone's quilts. As to my favorite thing about my mom? I need to dig for this one since I don't have a great relationship with her. I love her but our values are so far apart that it's a difficult relationship. I find that if I remove myself from the present and look back on my childhood I get glimpses of the woman my Dad fell in love with. I think she was a strong woman to have 3 kids under 3 by the age of 21. The favorite thing about my mother was her ability to make ANYTHING look nice and clean! She was a great homemaker and was beautiful! I miss her so much. Thanks for the opportunity to try to win this bundle I have been thinking about buying for soooo long! My mom is a very kind person. She demonstrates this each day and it is inspiring. I no longer have my Mom with me, but she was someone that everyone could count on . . . and I try to be that way too. I learned it from her. Still miss her every single day. My favorite thing about my mom is she is always there. For support and encouragement, never missing any game or event in mine or her grandchildren's life. She has always gone the extra mile for us! Amazing! My mom passed along her passion for crafts to me (her sewing, knitting, weaving) and became quite a birder in her later years. But mostly I loved her mischievousness. Now, when a hummingbird dances around in front of me, the first thing out of my mouth is .... Oh, Hi Mom! That her and I would sit, her at one end and me at the other, and sew the bindings on my quilts by hand and just visit and laugh. After her death, the first quilt I had to bind by myself had to dry before I could put it away. She was my rock and best friend. Laura V.
What a question... my Mom mothers anyone who needs it and really should have had more than 2 children. She is the most curious person I know and is always on the lookout for new information whether it's a recipe to try, results from the latest local sporting event of interest or current political issues. She is the Queen of Google! My mom tells it like it is. I appreciate that. This question really got me thinking. My Mom was a wonderful entertainer. So full of fun and adventure and had an ability to make everyone feel welcome in her home. She was always looking at the cup as half full and I so miss her positive calm in my day to day life and the joy she brought to everything. My favorite thing about my mom? She is an EXCELLENT quilter! (There are so many great things I could say about her, but quilter is perfect for this post!) Thanks for the giveaway! I love how independent she is and how she taught us to all be that way to. Her energy! For such a little women, she had an amazing amount of energy. My favorite thing about my mom is that she still worries about me and my siblings. She always wants to make sure that we are all okay. I guess you are never done being a mom. Thanks for the generous giveaway. My mom is just the BEST! She ALWAYS listens to me even if I have a harebrained idea and then very gently will ask questions about the idea which gets me to really thinking about it. Many times I've set off in one direction and then after talking to my Mom I end up really "seeing" the whole picture and I end up making modifications. She has really helped me to not get bogged down with the small stuff and not to be so hard on myself. She is just my best friend!!! Wow - what a great share! My favorite thing about my Mom is she loves all her children, grandchildren and great grandchildren unconditionally. She taught us all the love of God and shows it every day. My favorite thing about my mom is that she is generous ! She will offer whatever she has for me-- when my husband was in the hospital and we were behind on bills, she handed me $50,000 cash (no joke) so we could catch up. Mom loved a party and holiday's. When we were little she painted a really large (freezer came in it) box and made it into a spook house for Halloween. Thanks. She taught me to sew when I was very young and I made my first clothing when I was in 3rd grade. I don't think I'd be quilting now if I hadn't learned to sew at such a young age. She wasn't a quilter, but she used to crochet fine lace afghans. My mom is an angel in life form. She is always there to protect us and guide us through life's challenges and love us to bits and pieces. She is super special to me. Thanks for the giveaway...maybe this would be a great starter kit for my mom to try her wings out in the world of quilting! My Mom is a very generous person who is always thinking of others. She is also very good with children and has worked with them most of her life. I love your blog and thanks for the giveaway. My mom is generous with her time and money. Oh that is a great bundle and a good question. My mom was sick a lot when I was growing up - since she has had better health - she actually is my nanny a few days a week. I love to watch her with my kids and the cute relationship she has formed with them. I feel blessed she has felt better as she's gotten older so my kids get to see the fun mom I knew when I was little. My mom was extremely talented. She was a great cook, baker, sewist, and quilter. She could also knit, crochet, create macramé (when it was in style), stitch hardanger. I wish I had a tenth of the talent and creativity that she had. My mom is very generous with every people from long years, and she is the best in cooking, sewing, knitting...never tired ! I always admired her as a child and now of course . My mom and her mother, aka Nanny, taught me to sew at a very young age. My mom doesn't sew much any more, but she loves baking, often making two or three cakes a day! My mom always tried really hard. My Mum is my friend. Her thoughtfulness of others is something I admire. My mom taught me how to drive, even though I was scared and didn't want to do it (I should mention I was 20 when this was happening and would have gladly kept walking, taking the bus & getting rides for quite some time). We went in baby steps, from backing up & parking in lots, to driving on streets where I drove 20 in a 35 at first, to being able to go the speed limit on those streets. When I was finally comfortable with all that, she made me get on the freeway, and didn't even laugh at me when I hyperventilated and went 10mph below the speed limit. She just kept encouraging me and nudging me along, pushing my boundaries a little at a time, and my confidence (and driving skills) grew. I will always be so grateful for that. My mom is awesome. Not only is she my very best friend, but at 78 y/o, she still gardens and teaches yoga! I can only hope to be half as wonderful as she has always been. Thanks for the chance to win Historical Blenders. They would be perfect for Pam Buda's Nappy's Dowry. That Carolina Lily WAS amazing! My mom was funny. She made humorous comments all the time, laughing and making everyone else laugh with her. The life of the party. A wonderful talent that she passed along to me. Wow, what a great giveaway! One of the things I love most about my mom is that you can really, truly count on her - always. If she says she's going to do a thing - it is as good as done! I love the giveaway! Some of my favorites. My mom has dementia, and is in assisted living (she will be 100 on Jan 1) but she still has a sense of humor. She can't remember where she is most of the time, but always has a snappy comeback to teasing and jokes about what she is observing. Even though she is "out there" its great to have a laugh with her. My mother was the wittiest person I know, so clever with words. She could also draw. One time in the 1970s my birthday card contained caricatures of all of the cats in her household (of which there were many). Every drawing was spot on! She died 10 years ago. She taught me to sew when I was 12. How I wish she were here to share my quilting journey! My Moma passed away in April. I was asked to share some of my fondest memories at the service. Personally I was not able to do it but the Pastor read it for me. My Moma and I shared a love of sewing. She made everything her four daughters wore until we got to be in high school and wanted a few bought items. She made all and I mean every one of my father's shirts. She made my wedding veil and all five of my brides maid's dresses. I was the youngest and until I was born she sewed everything on a Featherweight. Daddy bought her a bigger machine when I was born. He told Moma if she had a boy he would bring her a dozen roses, she said if I was a girl she wanted a new sewing machine. The doctor came out to tell Daddy..." Go to Sears, she has the machine picked out." My Mom taught me to sew and the love of making things. She passed away in January at the age of 94. I still want to ask her how to do things. Miss her! Thanks for the chance at the fabric. I love that my Mom used to make clothing for me and my little sister when we were small. We'd always have matching Easter outfits and Christmas dresses. When I look at them in photos 40 years later I think "what WAS she thinking?" but at the time they were lovely :). My Mother My Angel... I was born in the 50's and grew up in the deep south with 3 sisters.. 4 girls and no brothers.. my mother was a great teacher altho she was a housewife,, she could do all things and taught us the way,, sewing, cooking, gardening, caring for others and on top of it all she made a dessert for our supper every single night! Amazing,, I'm doing good just to get a supper on the table. Thanks Thelma for sharing your stash! Yvonne P.
My mom taught me to love sewing and I've kept at it better than either of my sisters. My mom taught me patience with my children and was a great grandmother. I lost my mom when I was 14, but I always thought that she was a very strong woman. I only hope that I have half as much strength that she had showed me. One of my favorite things my mom did for us was, on really cold wintery days afters spending lots of time outside playing in the snow, she would warm the blankets in the dryer on HOT. As soon as we came inside we stripped and wrapped up in a toasty blanklet. We used to fight over who got "Grandma Nellie's" quilt since my mom only had one. I now do this for my kids and they love it! My favorite thing about my mom is that she always helps me whenever I ask and even when I don't ask. She is my support system and cheerleader when I am having bad times. I am thankful she is my mom. What I love about my mother is her strength and courage. At age 92 she still lives independently and takes really good care of herself. She swims in the local swimming pool every week and she is the coordinator of her weekly card club. At the moment she is on a cruise with my brother and sister in law. Way to go, mam! Although my mom was not a quilter, she did sew. She and I made a lot of my clothes when I was a teenager. If something wasn't quite right, she'd always advise me to 'press it out'. Good ironing advice still. Mom sewed and sewed all our clothes and many household items. The best part she taught me how to sew. My Mom died in 1995 and I still miss her. She taught me how to drive and to sew. She tried to teach me to knit and crochet, but she was left handed and I was right handed. It didn't work out very well, so my aunt ended up teaching me, but my Mom could help me if I ran into a problem. Thanks for the giveaway. I love the fabrics! My favorite thing about my mom would have to be her perseverance and her homemade desserts! Thanks for the giveaway. My mom loves our family unconditionaly. I love your blog so much. I didn't even know what they were until the Fat Quarter Shop advertised your fat quarter bundle. I was curious, and now I have quite a few blogs I follow. Thank you so much for sharing and all the inspiration. The Carolina lily quilt is just spectacular. It is a pattern on my list of quilts to make as I now live in South Carolina. My mom gave me my love of craft and sewing. She made a lot of our clothes when we were growing up. She was the glue that kept the family organized. Woohoo on your progress! My favorite thing about my mom is her generosity, graciousness, and love for my family. Thanks for the giveaway. You are right that Carolina Lilly is amazing! I can't believe it was quilted on a regular machine...! My favorite thing about my mom is probably how sensible she is and she is a woman that gets stuff done, especially when somebody really just needs to step up, she's there! My favorite thing about my mom is that she always stayed busy. Idle hands are the devil's workshop. Oh that stack looks delicious! My mom tells stories of sewing when she was young and loves that I sew, and she is always up for a new idea! There is no way I can narrow it down to one thing...so I will connect my favorite thing about my mom with regards to sewing. She taught me how to sew, from choosing fabrics to following a pattern. Here is the cincher: she made me DO IT RIGHT or else the seam ripper came out. I hated unsewing (and I still do), but it is one of the best things she has taught me. Do it right and do it neatly. It is her sewing legacy given to me, and I am thankful for her! what is YOUR most favorite thing about YOUR mom?!? My Mom taught me good morals & supported all my decisions. She's been gone 23 years & I still miss her. I would be thrilled to win your giveaway !! My best friend happens to be my mom. Every good thing I have learned, I learned from her. I learned some bad things from her, too. My favorite thing about my mom is the kooky/weird/out there/strange sense of humor that she has. It's a good thing she passed it on to me or we wouldn't get along as well as we do. Wow, what an awesome giveaway! My favorite thing about my mom is that she never backs down from the challenges in life and has worked hard to teach me to do the same! She is one strong lady! Love your blog, it's my favorite! My mom died at 59 of cancer when I was 31 and had just had my 3rd child. The most important thing I learned from my mother was that people are important. Possessions are never as important as people. She was also crafty, just not a quilter. One day she wanted to learn to quilt but sadly it never happened. I love to make quilts to give away to people, whether to my kids or to young couples in my church that have just had a baby. The thing I love most about my Mom is that she taught me how to sew...sew that I can make awesome things for my home and gifts for people I love! My Mom was a kind woman. She loved her family and her DOGS. She loved sitting in her recliner, watching TV and having a dog on her lap. Thanks for sharing your stash, too! My mother is gone now, but I think the most important thing she taught me was love of family. I really didn't realize how much she helped us, in so many ways, until I started helping my children(adult children). She was always there for me. "What is/was your favorite thing about your mom?" My favorite thing about my mom is that she was MY MOM!!!! That she was smart. She died in 1980 but at the time she was one of very few women on our local Army post who wrote and programmed computers. Way ahead of her time. I've forgotten what her voice sounded like (sad day when I realized that) but I still remember the pride in her smartness. Thank you for sharing with us!! 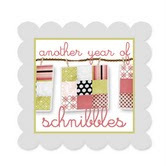 I have so enjoyed Lisa's giveaway - just seeing the different fabrics each day has been great fun. Just one thing about mom is tough - but I can talk to my Mom about anything and she has been supportive of everything I have done - even if she didn't agree! Hi Thelma! My favorite thing about my Mom was that she shared her love of needle crafts, cooking, and gardening with me. Growing up I always said I didn't want to be anything like her yet the things that really bring me joy all come from her. I'm so thankful she showed my sister and I how to sew, do cross stitch and embroidery, and always made such delicious meals. She loved flowers and working in the garden. I'm not sure I ever told her how grateful I was when she was alive but I sure hope she knew. I'm certain she sees what I'm doing now and knows she was the spark that lit the fire within me. My Mom would stop whatever she was doing to come to my rescue,she was one in a million and I still miss her so much. My mom has a loud laugh which used to embarrass me, but now delights me. I wish she laughed more at this time in her life. My goodness, what an incredibly generous giveaway! How sweet of you! The thing I like most about my mama, aside from the fact that she loves me, is her spirit and determination. She's wonderful! What I love about my mama is that she is the one who taught me the love of quilting.She always gave me the scraps that she had from her quilting projects. She showed me how to hand quilt at a frame hanging from the ceiling. She just turned 85 years young Sept. 24th. There are a lot of things I love about my mom. She was alway the go-to person for all of the family. She would help anyone who needed help no matter what happened. She is loved by all the family and she makes you want to be just like her. Thanks for the giveaway.. I thought this was going to be a post with tons of photos not words - you just crack me up some times!! I love coming here and getting inspired! Hi, a favorite thing about my mom would be her creativity. I remember wood fiber flower petals in the refrigerator (60”s) that she used to make roses. She sewed our clothing; she has done upholstery, embroidery, knitting, crocheting, tatting, oil painting, and beautiful wire wrapped jewelry. These days she makes us handmade birthday cards. She is always creating something and I think that has had quite an effect on me. That creative gene has been passed down to my daughter too – she’s a graphic designer! P.S: That was 85 words and mom just turned 85 last week! My mom was the absolute sweetest person ever. Remember Aunt Bee on the Andy Griffith Show? That was my mom. I miss her every day. what a very generous give away. My favorite thing about my mom is that I can talk to her about everything. I admire my mom and dad too so much, they both are very giving people. I know I am lucky to have both of them still in my life. My Mom was my best friend after I became an adult. She was always my rock, my mentor, my safety net. I miss her every day but still "talk" to her a lot. I think the greatest gift she gave all 5 of us kids was the ability for us to stand on own two feet. Take ownership of our decisions right or wrong. My mom is a very nurturing person who gets along with everyone and as a result, she has lots of friends. I'm one of nine children and I can say that there was never a day that my mom didn't tell each of us how much she loved us. We knew not only by her words, but by how much she made each one of us feel special. My mom always looks fantastic! She has always said that no matter how you feel, if you will get up in the morning and put your makeup on, comb your hair, and get dressed, you will feel much better. Mom is very stylish and beautiful at the ripe age of 85! Wow, that is a generous giveaway. I think the thing I like most about my mom is her determination and spirit. She believes that she can do something and she can. She's escaped near death a couple times and willed her way through. She's taught me that you should never give up on anything because your determination will see you through to what you want to accomplish. And she's been right. My mother was born in 1919. She was amazing. She had an adventurous spirit and was strong willed. Nothing stopped her. She traveled all over the world. One day I woke up in the middle of the night. She was all alone in the kitchen watching TV singing the song "Far Away Places,." She loved to sing and she loved to travel and she loved to experience life. My mother was what my husband called grumpy. In fact that was his name for her. But underneath her grumpy demeanor she had a heart of gold. She very seldom told me that she appreciated what I did for her, but since her death in June of this year, all of her friends have told me how much she bragged about her daughter "who did everything for her." My Mom loves to bake bread. As a child, I loved coming home from school to find the counter filled with homemade buns, rolls and breads. I always got to share my day with my Mom while having a warm bun with peanut butter melting off the bun...special times. Thanks for reminding me of those times and for the chance at your marvelous giveaway (that bundle is on my wish list!). I have always loved that collection. Love your blog. You do a great job of maintaining it and keeping it interesting. My Mother could do anything with her hands....crochet, knit, weave, sew, play the piano. She was awesome with her talent, and always encouraged me to do whatever I wanted. I think of her every day in my life, and I think that is the greatest gift of all...she is always with me! Thanks for the wonderful and very generous giveaway! Thank you Thelma for a chance at the give-away. Hmm, my favourite thing about my Mum? That she's my Mum! But really, that she taught me to sew. With raising six kids on her own, it was astounding how she had the time to teach me. She's a beautiful seamstress & so glad I paid attention! My mom is awesome! She is an accomplished artist - water colors and acrylics. She was my first sewing teacher and is my biggest fan in my 'artistic' pursuits as a quilter. What I admired (she passed away last month) the most about my mom was her strength and ability to do anything. She came over from Germany in 1955 with a 4 year old and a 6 month old in tow, leaving her family behind, to be met by in-laws that she had never met before. Her new husband had been stationed in Germany. Then when I was in 1st or 2nd grade, dad had an accident that left him paralyzed from the waist down. Mom took care of him till he passed away in 1983. Mom had to learn to do a lot of things because Dad wasn't able to do them. She cooked, cleaned, did carpenter work, mechanical work, etc. She was the first female machine maintenance worker at her job in the 1980's. Sorry I got so wordy, but I admired my Mom very much. The favorite thing about my mom is how "smart" she is...now that I'm a mom too. I also love that she's started quilting so I have someone's stash to shop! My favorite thing about my Mom is that she is THRIFTY and resourceful. A farm wife with six kids, big garden, canning, cooking, sewing machine humming making clothes, butchering chickens, selling eggs, etc. You name it my Mom did it. Love You Mom! My favorite thing about my Mom is that she's funny! She just has a way about her that always gets us laughing and having and good time. And she likes being silly and having a good time -- it's hard to not have a blast when I'm with her! my mom's smile. thanks for the chance at some great fabric! My mom is all about family. She was also a great seamstress!! My mom contended with disfiguring psoriasis and was crippled with psoriatic arthritis. At times she could not even get out do bed, and she waged a never ending war to keep her skin in control. But people remember her for her deep concern for others, her generosity, her liberal openness and acceptance of others. She died at age 57 and I miss her so much. Oh...I have lots of favorite things about my mom! One is her creativity (she owns a stained glass shop and still teaches tons of classes) and her love of sharing that with people. My favorite thing about my mom is her laugh. My favorite thing about my mom is that she always encourages us to learn new things. And she taught us all to enjoy gardens, flowers, and nature. Is it okay if I have two favorite things?! my mom use to love to try new crafts. i use to love to go and see what new project she had going. i got the creative bug from her. My mom was a strong woman and passed that trait onto me. She really could use a sledge hammer. My mom was a quiet but strong woman who loved the Lord with all of her heart. My mom was the greatest. She had 7 sons and 4 daughters. When any of us would come home for a visit , she would bake and cook all our favorites while we were there! She is missed. My mom has passed but she was the most amazing mom in the world. She (was really an Aunt) adopted my sister and I at a very early age and did everything possible for us. I truly miss her. She was the one that taught me to sew. Thank you for the chance to win some stash as I am a newby to quilting and I don't have much.